BOYNE FALLS – John Seltzer, the head golf professional at Blythefield Country Club near Grand Rapids, calls The Monument course at Boyne Mountain Resort one where a golfer holds on for dear life. th 1-under-par 71 Tuesday in the second round of the 25th Tournament of Champions, and will start Wednesday’s final round with a one-shot lead on hard-charging Kyle Martin, an assistant professional at the Lochmoor Club in Grosse Pointe Woods, and five-time champion J.R. Roth, the head professional at San Juan Country Club in Farmington, New Mexico. Tee times will start at 8 a.m. Wednesday off Nos. 1 and 10 tees as the unique $55,000 championship concludes on the Alpine course. The final group of leaders will tee off at 9:30 a.m.
A cut to the low 60 golfers and ties after the second round left 61 playing at 152 or better in the unique 54-hole championship that brings together professional and amateur men, women, juniors, seniors and super seniors who have won recognized championships in Michigan. As it was, Martin and Roth found a way to go low by making birdies on the front nine. Martin, who shot a 5-under 67, made six consecutive birdies on holes 3 through 8 and checked in at 138. Roth got to 138 with a 68 that featured birdies on Nos. 3, 5, 6 and 7. Roth, who like Martin started his round on No. 10 tee and played the front nine last, said he kept waiting for something to happen. Eric Lilleboe of Okemos, the first-round leader, had five three-putts in his round of 74 for 139. He was joined at 139 by Grosse Ile brothers Jeff and Steven Cuzzort. Steven shot 71 and Jeff 72. The 140 group, just three behind, included former LPGA player Elaine Crosby of Jackson (69), PGA of America Senior Player of the Year Brian Cairns of Fox Hills Learning Center in Plymouth (70), Michigan Open champion Jeff Bronkema of Wayland (73) and Korey Mahoney of Manton (69). 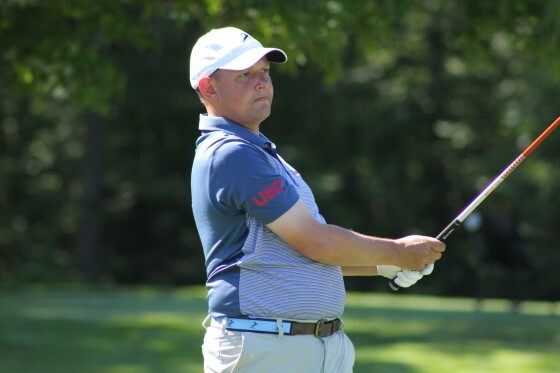 Scott Hebert of Traverse City Golf & Country Club, the 2009 champion, was at 141 after at 70, and two-time champion Andy Ruthkoski of Muskegon (2013, ’14) was at 142 after a 71. It should be a shootout on the Alpine for the final round with 15 golfers within five shots of the lead, and Seltzer realizes what he must do. Martin is fine with the Alpine. Roth, 58 and a Michigan Golf Hall of Famer who won his previous Tournament of Champions titles in 2012, 2008, 1999, 1996 and 1995, could make more Michigan golf history with a win. The former Flint and Detroit area club pro is currently tied with legend Al Watrous for the most Michigan major championships all-time at 15.